This morning when I left for work there was a train set in the middle of my living room, a laundry basket blocking the hallway between my bedroom door and the kitchen, and shoes. Shoes just everywhere ~ I live with one grown man and two teenaged boys in addition to the giant dog and hyper toddler. These shoes are large, and haphazardly tossed here and there! What I’m trying to say is that things were not – in order – upon beginning my day. So, here is my question of the day: when you get home from work, do you also feel compelled to put everything around you back in order before beginning the rest of your evening routine? I can’t even take my shoes off and make a cup of coffee before I pick up the toys, empty the dishwasher (then refill it!) and sometimes even vacuum if the rugs look mussed up enough. I can’t really be the only one who does this. . .right? So it’s on mornings like these that I know before I even pull away from the curb that when I return sometime tonight, I will instantly feel put upon and stressed. This is just how I’m made. BUT I think I’ve found a solution ~ it’s called. . . . The Crockpot! Rest assured, more recipes will be forthcoming – collecting really delicious crock pot recipes has become a new passion of mine – but for now you’ll have to settle for just one. Luckily, it’s a good one! 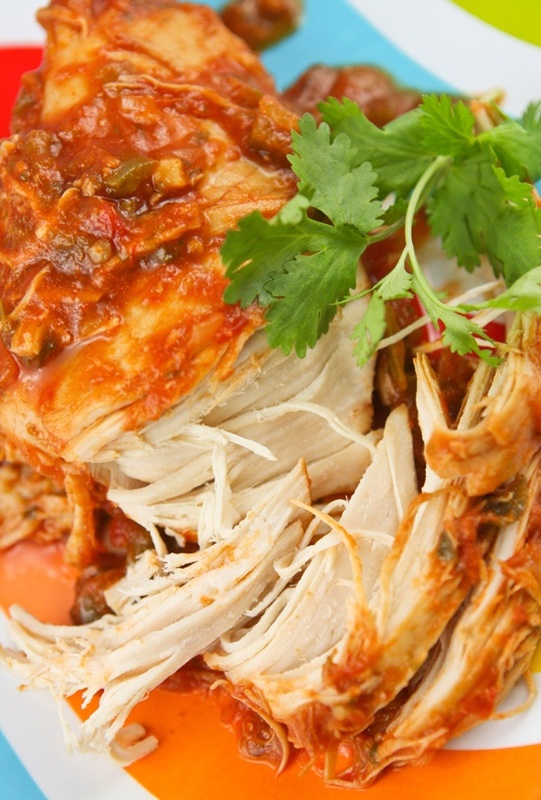 Click here for Cilantro-Lime Chicken Recipe! Oh. Yum. Oh. And here’s a few shortcut tips you can take right to the dining room table ~ don’t bother defrosting the chicken (breasts, thighs or tenderloins, it all works!) just dump them in frozen right along with everything else. Add about half a container of sour cream right into the crocker before serving, and I urge you to try it as a dip with some tortilla chips as well as using this as a main course! We’ve had it over rice, as burritos, by itself as a main dish – no matter which way it is always a tummy filling, crowd pleasing, one pot clean up delight. So. . . what are you waiting for?